Phil Morgan, President of ProSilva Europe and known to many ProSilva Ireland members recently wrote an article on “The Case for Continuous Cover Forestry”. The Forestry & Timber News Journal has kindly allowed us to re-publish the article here. It has also been added to the Articles on the ProSilva Ireland website where you can find other articles on continuous cover forestry management. AFI Research stand No 67, Stourhead (Western), Wiltshire, England. Continuous Cover Forestry (CCF) is the management of continuously productive irregular stands in forests and woodlands that are created by the selection and harvesting of individual trees. CCF has a dynamic and evolving growing stock that is maintained through adaptive management providing the conditions for greater resilience and integrated economic, environmental and social benefits. 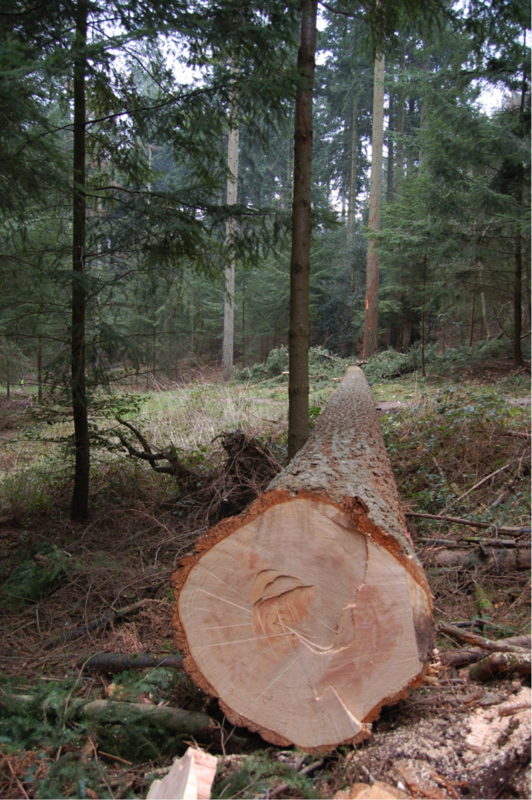 CCF stands produce timber on a regular cycle without undergoing shelterwood phases of capital reduction. Just as a Passivhaus makes use of the design of the building to provide cost-effective environmental benefits, so CCF makes use of the design of the stand to provide cost-effective economic and environmental benefits. Just as the apparent baffling complexity of quantum physics can be reduced to universal principles, so the apparent baffling complexity of CCF can be reduced to simple underlying principles. Complexity is a feature of the natural world and of ecosystems. It is found at different scales at the landscape level or at the level of the forest stand. Complexity is horizontal, across site types and biogeographical zones, and vertical, as in stand structure. The reason why CCF is sometimes called Close to Nature Forestry is because it manages the complexities within natural systems without attempting to mimic wilderness. CCFG have a list of simple Principles that manage this natural complexity and provide the adaptation and responsiveness to extreme and changing conditions. Target diameter Douglas fir, Stourhead (Western). Improved stem quality is achieved through manipulating stand structure by regulating light, just as regeneration depends on canopy density and seed sources. The hand of man is very much present in all CCF systems leading some to question the term Close to Nature and preferring Continuous Cover. This is demonstrated by the different approaches to CCF between Europe and North America with very different forestry histories, traditions and landscape scale. The Americans came to Europe to learn from the vast array of systems to regulate and control forests in order to ensure sustained yield. The great debate between European foresters was whether regulation was set by area or by volume. All area based systems were easy to regulate and to systematise leading to a many different systems. The management systems regulated by volume produced very carefully regulated systems and approaches that defied definition as systems that relied on intuition and monitoring. This was all in a brave new world where industrial development and imperialism were blindly carving up the world and consuming resources on an unprecedented scale. Now we have inherited a legacy of dwindling and increasingly threatened natural resources and climate change on a scale that might put our planet into reverse. Nowadays forests have to sequestrate carbon dioxide, store carbon, retain and regulate water, provide reservoirs for biodiversity, buffer the effects of intensive agriculture, as well as producing timber. One of the debates between foresters in the previous two centuries was that irregular forests could maintain the same productivity as uniform systems but at the same time protect the naturalness of the whole forest environment, including soil and water. This is now one of our main present day preoccupations so, if we recognise that irregular systems provide the same quantities of timber as a well as the environmental protection from permanent cover, we have a system for the 21st century and a serious tool for meeting the challenges of climate change. Engines for timber production only do one thing, forests have many more roles to play. AFI Research stand 106, Knockrath, Co. Wicklow, Ireland. The case for CCF can be made in different ways. 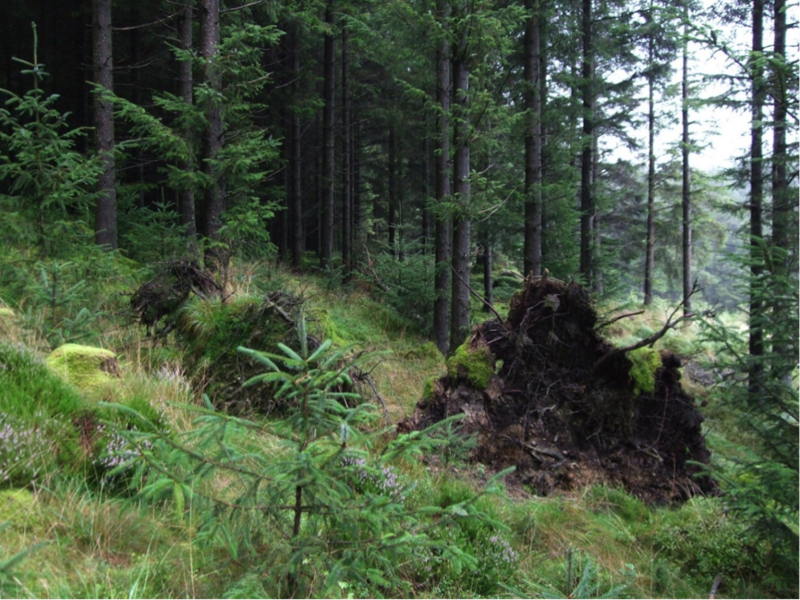 One is to attempt to model silvicultural scenarios to provide an idea of how irregular stands function. There are some extremely complex models that will accommodate a wide range of input variables but these are difficult to use and serve the purposes of academics rather than the needs of practical foresters. The other aspect of modelling is economic, which is used to justify the choice of different systems. Because of the huge injections of cash in the clearfell scenarios it is difficult to make the case for selection systems when economic analysis is limited to simple economics unless interest rates and longevity are manipulated. More complex models that integrate, ecosystem services and risk management will provide different answers and provide a measure of the cost of high risk intensive options. Owen Davies and Gary Kerr produced a useful paper in 2011 where they make an economic assessment of four different scenarios generating NPV/ha (3.5%) from cash flows over 20 years, 100 years and in perpetuity, (Costs and Revenues of CCF, Owen Davies & Gary Kerr, March 2011). The model is constructed using simple assumptions contrasting clearfell and replant with transformation to a complex structure and 2 intermediate types of shelterwood. The accompanying spreadsheet allows the forest manager to vary the inputs to test the sensitivity of different factors. It is a simple model that is constrained by its limited scope, (tables have a max dbh of 50 cm and the irregular stand structure model is not realistic). It is however a useful tool because it establishes the idea that there is a wider choice of options presented to forest managers. The model shows that the NPV for the irregular options tend to improve over longer timescales providing managers with the confidence to develop long term visions for transformation. An alternative to modelling is detailed monitoring of actual examples of CCF. This has the advantage of demonstrating within a very short space of time how a system works and how it performs both biologically and economically. Monitoring can also easily incorporate environmental factors, biodiversity, carbon sequestration and other characteristics of interest on the site, either as part of the monitoring process or by combining data gathered separately. Rather than speculating on possible outcomes or testing the effects of different theoretical systems, monitoring provides a record of evidence from practical experience. This has been achieved in the South of England and in Ireland where the best examples of CCF on different properties have been measured using the AFI protocol. This has provided baseline data from all the sites with the first set of measurements but, of far greater interest, details of increment and change from repeat measurements on two of the Research stands so far. Increment is a measure of performance and is of greatest interest to the forest manager and to the owner of the woodland since it measures productivity. Since the AFI monitors both biological and economic performance the increment is defined in terms of timber production and of economic production. This can be correlated with additional characteristics such as ecosystem services, carbon sequestration and storage that can be quantified and related to the stand structure. Because the protocol is setup on a series of permanent sample plots and requires re-measurement on a five year cycle any increase or decrease in any of the characteristics that are recorded can be detected. The proportion of regeneration passing from the seedling to the pole stage may be an indicator that the stand is overstocked or that the increase in the proportion of a shade bearing species may be threatening the viability of a light demander. The data is of immediate interest to the manager in charge of the stand however the data accumulated by the AFI over the past 20 years provides the largest database of CCF parameters available for research. Andy Poore, supported by Woodland Heritage and the Forestry Commission, has demonstrated in a number of studies the importance of recording increment and its relation to the growing stock. 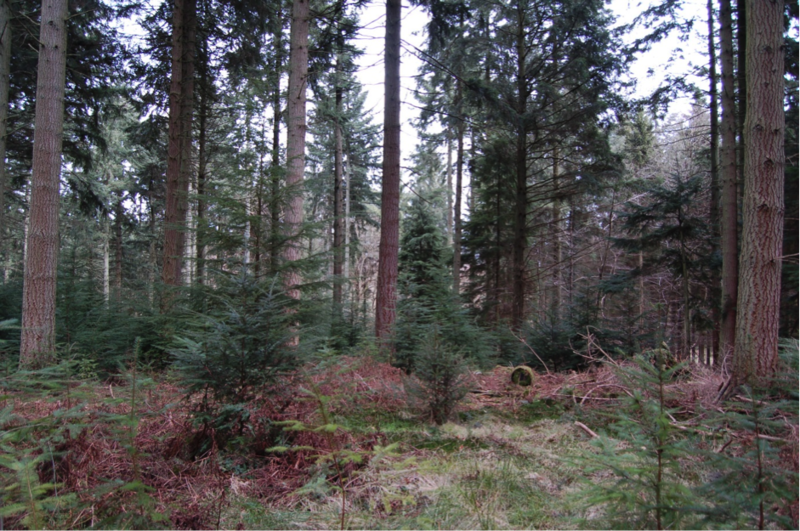 (Continuous Cover Silviculture & Mensuration in Mixed Conifers at the Stourhead (Western) Estate, Wiltshire, UK. Poore A., 2007). He has since shown how effective the AFI protocol is for the efficient gathering and recording of data and his work with Richard Deffee in developing an abbreviated protocol for independent use outside of the formal Network, (Continual Inventory for Irregular Forest Stands, Deffee, R., 2014). 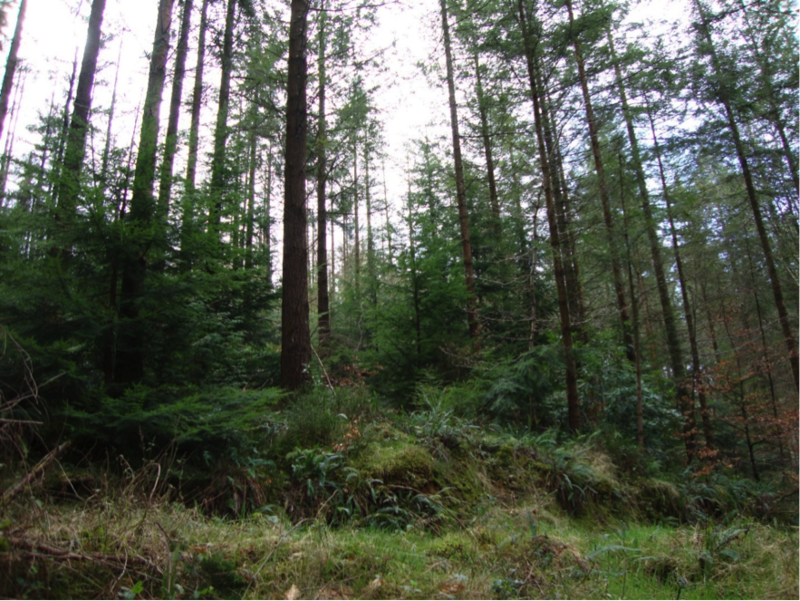 Upland transformation in Sitka spruce in Wales. Continuous cover management operates by applying the principles of Continuous Cover Forestry and is not restricted to clearly defined sylvicultural systems. Many forests in transformation from even-aged management to irregular forest management will succumb to phases when the growing stock is liquidated due to the overwhelming impact of outside factors but the application of CCF principles will have initiated a more irregular complex structure that will enhance the next phase of transformation. Even though the forests will undergo an unproductive period in order to rebuild capital and therefore be undergoing a transition as shelterwoods they will continue on to develop irregular structures and produce the benefits of single tree selection. All irregular stands are exposed to the risk in one form or another but the more developed the irregular structure the faster the impoverished stand can re-establish an irregular structure. The benefits of continuous cover are economic but, in a more subtle way, they protect the environment and enhance biodiversity, all at once, and across the entire forest. Philippe Morgan is the President of Pro Silva and Vice-President of the Association Futaie Irrégulière (AFI). He is a forest manager and a forestry consultant with Sustainable Forest Management and SelectFor – Specialists in continuous Cover.